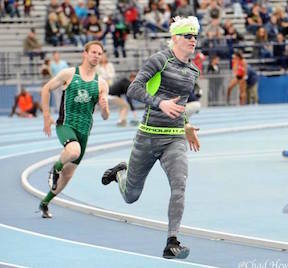 Tyson Gunter is a track and field athlete who competes in the T13 class (limited vision). During high school, he earned all-state honors in track all four years. After completing a full-time mission for The Church of Jesus Christ of Latter-day Saints, he competed on the Idaho State University track team. After graduating with a bachelor’s degree in marketing, he won the silver medal in the high jump at the Paralympic World Championships in Lyon, France (2013). Two years later, Gunter took the silver medal in the long jump at the Para Pan America Games in Toronto, Canada. The International Paralympic Committee removed the jumping events for the T13 class, so Gunter competed at the 2016 Paralympic Games in Rio as a sprinter in the 100 meters and 400 meters. He qualified for the 400-meter final with a time of 51.30 seconds. He placed seventh with a time of 50.36. Gunter was born on October 21, 1986, and grew up in McCammon, Idaho. He has albinism—his skin, hair, and eyes lack pigment—and suffers from vision impairment, as many albinos experience. He has limited peripheral vision and almost nonexistent depth perception. "The best way for me to describe this is looking through binoculars backwards," he said. This page was last edited on 29 December 2016, at 15:19.